You have a lot to worry about on a daily basis, don't let wire and cable be one of them. By practicing some general guidelines for electric wire and cable you can extend the life of your cable, reduce downtime, reduce safety and non-conformance issues, and increase your overall efficiency with longer runs. Educate maintenance personnel on cable limitations and what to inspect to reduce cable failures. Avoid kinking or twisting during installation. This can mechanically stress and weaken the conductors. Keep wire and cable away from any elements the application does not have to be exposed to (such as direct flame). 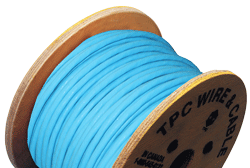 Periodically reverse cable ends to prevent one end from experiencing prolonged exposure to the harsh environment. Account for voltage drop, if left unaccounted for it may lead to premature machine/motor failure due to overheating. Proper care of your wire and cable is imperative for reducing downtime and keeping systems running on a continuous basis. By utilizing these five general electric wire and cable guidelines will help you maintain the life of your wire and cable products. *Harsh environments in electric wire and cable applications can include abrasion, chemicals, extreme temperature, flexing, impact, and tension; or any combination thereof.